Located on the Executive Dashboard this area can be used to keep your Jackrabbit Users advised of announcements and important information. Click the Edit link to edit the Announcements area. Use the editor tools menu to add formatting as desired and be sure to click the Save button. Click the Refresh Dashboard button to see your changes. Dashboard Announcements can also be edited from the Tools menu > Edit Settings select Dashboard Announcements. 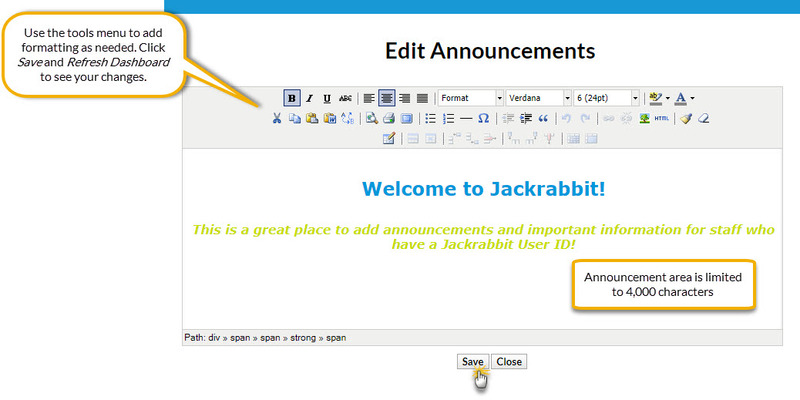 Click the Edit Announcements button to open the editor to format your announcement.